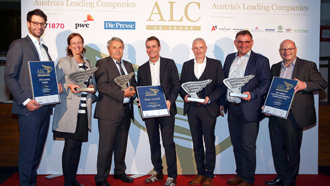 At the Wirtschaftsgala (economic gala event) held at the festival theatre in Bregenz, Austria on 12th November, 2018 CHT Austria GmbH was awarded first prize at the most important Austrian economic competition, "Austria's Leading Companies" (ALC), in the category "Nationally active company up to 10 million". Five companies had been nominated. Their balance sheet figures and their economic performance of the last three fiscal years had been compared by means of a specifically developed objective key figure model.